These are classic examples of how product upsell and cross-sell work. It creates a more personal engagement; a two-way dialogue between the seller and the buyer that increases your potential sales without pushing too hard. Yet, in an e-commerce environment, there are no physical salespeople or cashiers who will assist and guide shoppers in their overall shopping sessions and who can suggestively ask relevant upgrades or add-ons to maximize the transactional value. This becomes an obstacle to many online retailers, with 74% struggles in personalizing real-time offers, to create a dynamic web shopping experience that could allow them to provide product upsell and product cross-sell for shoppers. And so, how do you fully take advantage of product Upsell & Cross-sell techniques? How do you benefit if you enhance them? This article outlines the key characteristics and offers practical tips in product Upsell & Cross-sell techniques that will help e-commerce stores achieve a boost in revenue and lift in customer loyalty and satisfaction. How to differentiate Upselling & Cross-selling? There’s a subtle difference between product upsell and product cross-sell, which is why the two have always been combined as a single discipline. Both, theoretically, helps in increasing the transactional value of your shoppers which in return maximizes your sales. Product upselling happens when a merchant suggests an upgrade to a superior product, usually in price, features or version, based on the one selected by the shopper. On the other hand, cross-selling takes place when a merchant suggests add-on items that could complement the products selected by the buyer. 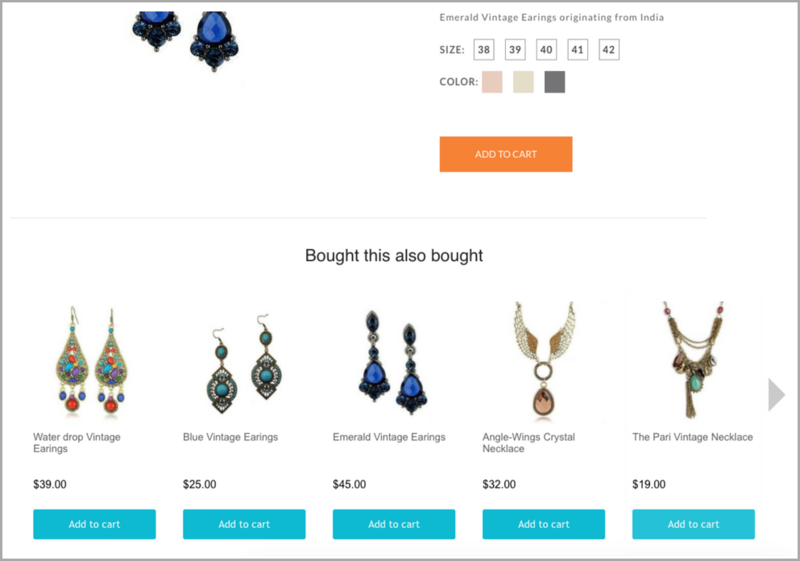 Why should Ecommerce entrepreneurs use product upsell and cross-sell tactics? If you want to significantly improve your sales, product upsell and cross-selling are drivers to maximize your profits with each customer as you want your shoppers to buy more with every transaction. By implementing cross-sell techniques, you can increase your revenue as high as 70%. On the other hand, product upsell efforts can also drive your sales by up to 35%. That’s why incorporating them both to your online store could significantly expand your bottom line results. Ready to be more profitable? We have these guide of product upsell and cross-selling techniques to help you win your shoppers’ heart. The most common way of product upselling is through upgrading techniques. Upgrading is the process of changing or updating an item to a newer or higher version of the same product but for a higher price. The main goal of upgrading is to actually help customers to buy the most up-to-date and more improved version of what they are buying now. But at the same time, you are also encouraging them to make a larger price purchase. In an e-commerce environment, you can fully leverage on this strategy by creating selection buttons of the upgraded version of the product. Help Me Choose: Dell has a “Help Me Choose” corner which allows shoppers to select what version of the laptop they will get. Not pushing too hard, Dell showcases a “Dell Recommended” to upsell the higher version of the system. 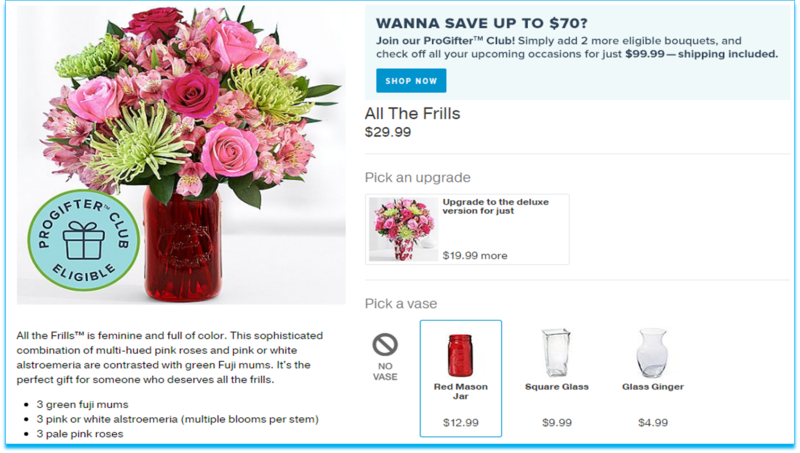 The Deluxe Version: Proflower offers a “deluxe version” of their vases and even an option to upgrade to more affordable vases. Get upgraded at special discount: When you offer customers an upgrade, you expect them to pay more. What can be a more convincing reason why they should change to a superior yet more expensive upgrade? Shoppers don’t buy products right away, they will compare different items first before arriving to a decision. In fact, 94% of online shoppers invest time to find the lowest price. And so, how can you make sure the profitability of your more expensive items? Use the decoy effect. It happens when consumers will tend to change their preference between two choices when a third item is presented. The decoy effect is commonly used to product upsell your pricier items by increasing their perception dominance. The effect is based on presenting the more valuable features of expensive items versus the cheaper ones. 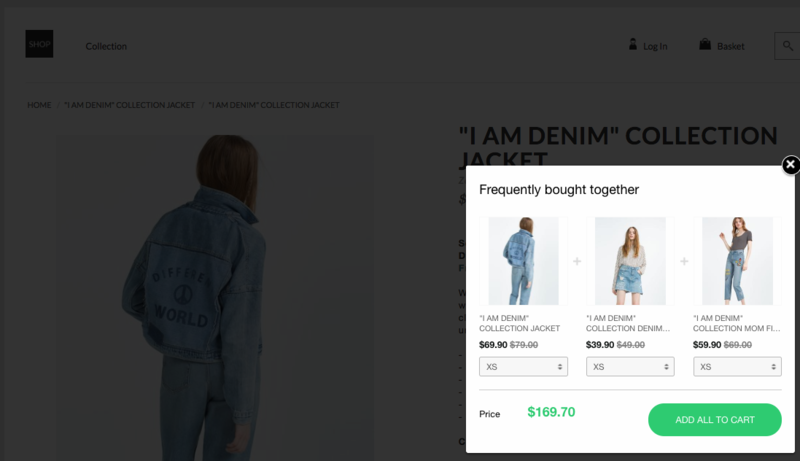 Here’s an illustrative example of how you can apply decoy effect in your product listing to put the preference perception on more expensive items. Consideration Set 1: In this example, shoppers who are price conscious will go for flash drive B while those who go for bigger storage will prefer A. Consideration Set 2: The addition of flash drive C changes the buying decision. It now acts as a basis comparison for A and B. Because A is better than C in storage for the same price, while B is just partly better than C in value, more shoppers now will be more inclined to the more expensive product than they did in the first set. Previous shoppers’ buying behavior could help you predict the right items to product upsell or cross-sell. By investing in predictive analytics, you can create a personalized recommendation whenever a shopper visits your site. Thus, increasing your revenue potential as 31% E-commerce site’s revenue were generated from personalized product recommendation. The general idea is you create an algorithm which upsells or cross-sells a certain product whenever this item is being viewed by new visitors. Your algorithm will be based on the behaviors of your previous shoppers. These behaviors can be divided either on purchasing trend or browsing pattern. Browsing pattern: Very.co uses the past browsing behavior of web visitors to cross-sell similar products. Purchase history: Amazon uses purchase behavior to product upsell and cross-sell relevant items that shoppers will likely buy because of the previous buying trend. Supplementary products are two or more items that are used together. For instance, if you buy a juicer you will need to buy the fruits or vegetables to juice, otherwise it is pointless that you have a juicer. The most commonly used term for supplementary products is ‘complementary’ products. It is the same principle of two or more items being used all together. The one cannot be used without the other, that’s why a supplementary item are best promoted via product upsell and cross-sell strategies. Frequently Bought Together: Amazon focuses its cross-selling efforts by suggesting the supplementary items that go well with the item selected. Shoppers can conveniently add all of the three items all together in their cart. There are moments when your items are running out-of-stock so it won’t cover the needed quantity of your shopper or worse they have already been sold out. And so most of the shoppers leave your site because they don’t have the items that they need. But don’t despair, this is actually a perfect time for you to cross-sell your substitute or alternative products. Substitute products are items that could be good alternatives to the product that they’re looking for. For example, if your shopper is looking for oregano herbs but you’ve no available supply, you can offer available substitute herbs like thyme or basil. Placing your substitute products is a cross-selling strategy that gives the opportunity to promote your available replacement items. Metrodeal, for instance, promotes its live alternative products beside the sold-out item. Instead of just offering your shoppers an product upsell or cross-sell items during their browsing session or shopping cart process, you can do it right after they’ve purchased an item. What you can do is to show a popup message containing products that might stir their interest. 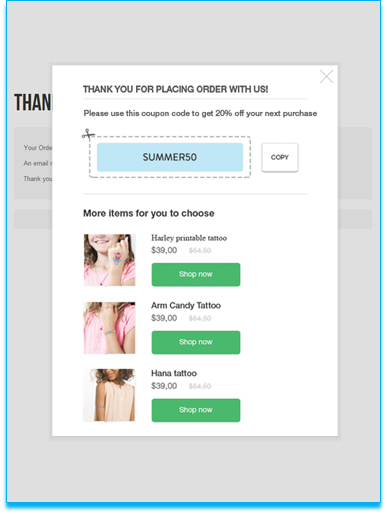 The popup upsell or cross-sell products can be included behavior-based analytics or simply you want to promote your bestsellers or your newly arrived items. You can apply any of the above strategies here too because post-purchase popup product upsell and cross-sells can contain endless strategies to promote your products right after your shopper purchased an item. Thank them for their purchase, plus this Quick Tip: You can easily plug-in Checkout Boost which has a Post-checkout-product upsell popup capability to encourage your shoppers to buy more items from you after finishing an order. Based on customer’s past purchases, you can really guess what they might like to buy if they come back to your store. Then you have their email from past purchase registration…what’re you gonna do to take the chance? Upsell & Cross-sell via newsletter. 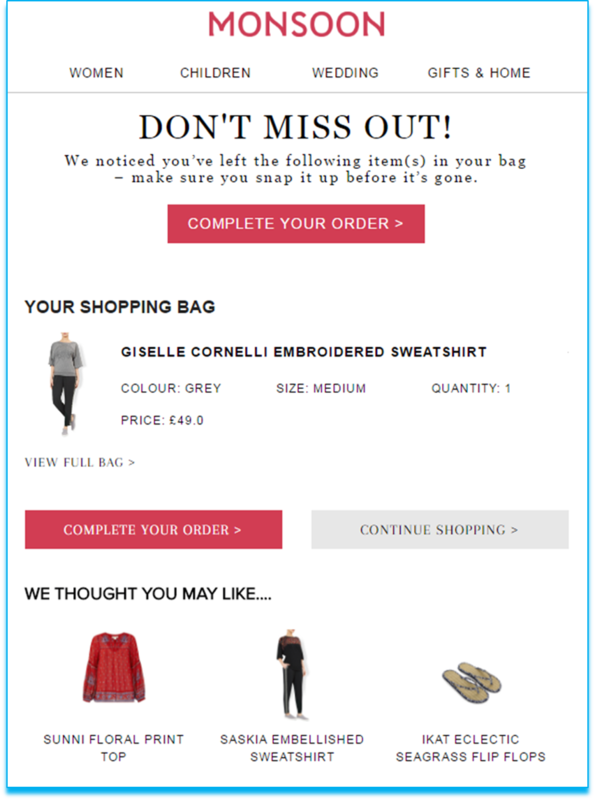 5-7 days after your customer’s last order, you can schedule a follow-up series of email that offers product upsell & cross-sell tailored by their bought items. Make sure your emails are carefully crafted and contain highly relevant products to each customer. That way, you can connect, engage and drive return sales from your buying customers. The average cart abandonment is 68%. That’s a high number of shoppers leaving your site without completing the checkout process. With your efforts to recover your cart abandonment, you can also use this as an opportunity to upsell or cross-sell your other merchandises. 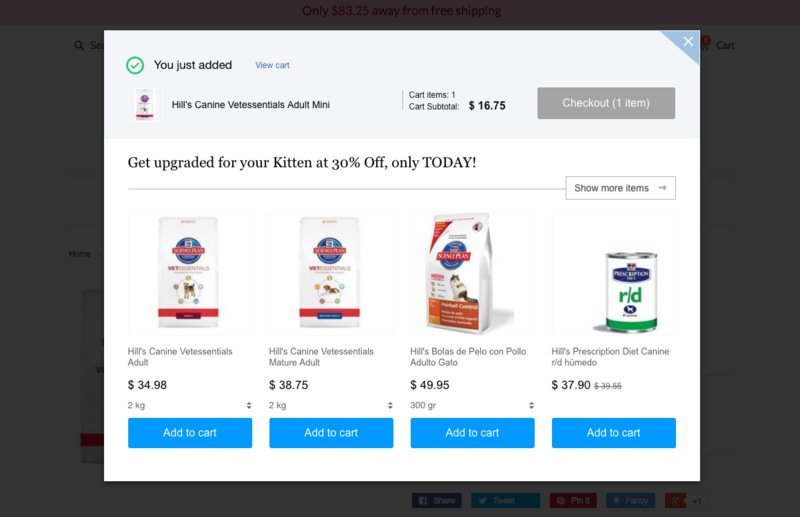 This strategy helps you suggesting new and more options to your cart abandoning shoppers because some of them may be comparing prices or features before deciding to buy. If you are sending a cart abandonment email reminding them that they’ve left an item in their cart, don’t forget to showcase other merchandises that they might like. Monsoon includes product upsell and cross-sell efforts in its cart abandonment email. Are you ready for more sales? Product Upsell and cross-sell techniques do wonders in increasing your average transaction size and ultimately in expanding your sales. However, as any marketing strategy to work, you have to make sure that you’re focusing on what your shoppers need and want. With our practical tips and proven strategies above, you are not only meeting or over-achieving your revenue goals but you are also putting your customers’ experience into the spotlight. And with happy and satisfied customers, you only have one question to prepare for: are you ready for more sales? I’ve Shopify store. Maybe you can suggest me really effective upsell app for Shopify? You can try our Boost Sales app. It’s one of the best upsell and cross-sell app in Shopify App store.